“State’s Largest Manufacturer Sheds 1,500 Jobs!” “Telco posts $3bn profit!” Ever wonder why those sorts of headlines sound so shocking? It’s because many people – those who don’t manage money for a living – can’t personally relate. Many simply do not think of managing their households like businesses. The truth is, you’re the de facto Chief Financial Officer of your household. 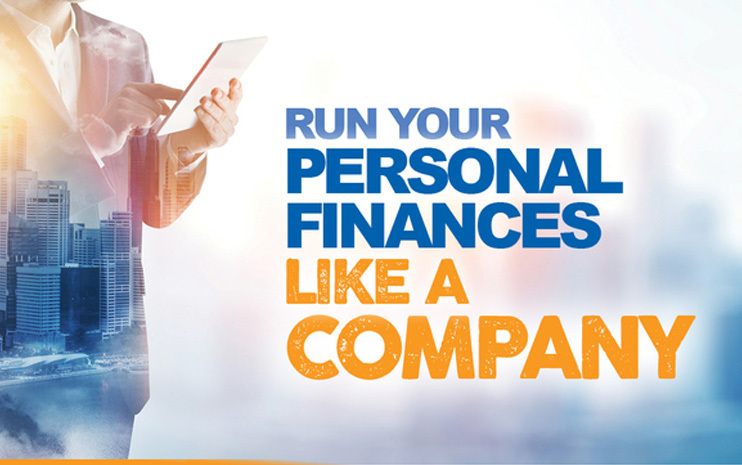 If you take a step back and evaluate your personal finances from a business perspective, there is much to be gained. You wouldn’t start a major renovation without a plan and a budget, so why do you manage your personal and household finances on the fly? It’s probably because you’re not looking at the bigger picture. If you look at your income and expenses over a year, five years or a decade, it’s easy to see why it’s important to plan ahead to achieve your objectives. Knowing your net worth is an important foundation for making more informed financial decisions. Take away what you owe to from what you own to calculate your net worth. Make a plan to grown this by either increasing your assets in value and/or decreasing what you owe. Watching your expenses doesn’t just mean keeping receipts. It means looking at every single thing you spend money on, and deciding whether it’s really worth it. Set aside a particular time to review your spending. Bring together your receipts or open your internet banking account. For every spend, ask yourself: do I need this, or do I just want it? Is this saving (quantifiable) time/ money/producing a return? What else could I have done with the money I spent on this? By definition, overheads are expenses which aren’t directly related to income (the way materials and labour are). They’re also known as operating expenses. These ongoing costs include your rent or mortgage, utility bills, and groceries. The quickest way to save a large amount is to review your mortgage arrangements. Are you getting the best rate you’re eligible for? The same goes for utility bills. There is so much competition amongst gas, electricity and phone providers, chances are, you can get a better deal for your household needs. Many people have difficulty turning savings to a habit. One quick way to get around this is to set up a small, regular debit from your transaction account in to your savings account. There are also a range of apps designed to help visualise and ‘gamify’ savings goals – much like a company would structure a bonus program. Tax planning is particularly important if you run a small business or hold significant property investments. In addition to the little deductions and offsets you claim on a regular basis, it’s a good idea to look at the business structure, and whether it’s optimised for your family situation. Outside of a small business setting, there are other things you can do to save on tax, including (but not limited to) salary sacrifice in to your super, and mortgage offset accounts. Please note that it’s important to get professional advice on tax planning matters; feel free to give us a call. Thinking like a CFO, you should always be looking for opportunities to grow your income. This includes diversifying income streams. The easiest way to do this is to leverage the assets you already have. For example, that spare room that lies empty at the moment – why not rent it out? Have you invested time and money in a large, beautiful garden that someone might like to use for a special event? Do you have skills and expertise that could be applied to an enjoyable, profitable side business? Feeling inspired? Ready to take on the role of CFO? Contact us to arrange a discussion today.